Taking the “Unprocessed” challenge is just that for me, a real effort to go 100% eating no processed food for a month. But making a solid effort is well worth it, and at our house we try to maintain this lifestyle every month, not just October. Last I heard, Andrew had over 10,000 folks signing up to take on the challenge! Want to jump on the “Unprocessed” band-wagon and try it? I love making chutney – easier than jam and such a versatile condiment to have on hand in your pantry. <– Amen Liz! So true and I agree! Your chutney is beautiful! Thanks, Averie – my pantry is stuffed with chutney right now. I think a batch of this chutney would be the perfect addition to our Thanksgiving table this year. Liz I have been drooling over your chutneys for months, it’s time for me to try making one myself! 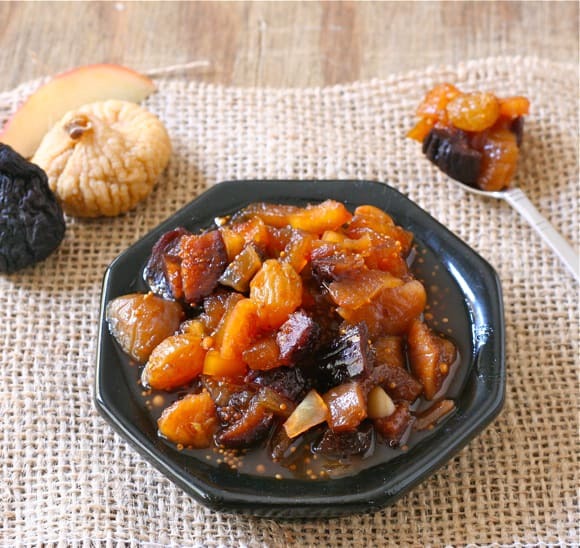 I love the idea of a sweet chutney at Thanksgiving. I love, love, love this chutney. The jar we brought home with us from your place is long gone now, and Myles wants more. So do I. Guess I’ll be making this over the weekend :-). Thank goodness you’ve posted the recipe :-). It was absolutely delicious. I just wish I could swing by and pick up another jar :-). Looking forward to making a stash of it this weekend, my friend.